Ah, the sultry sounds of Pyramid Solitaire: Ancient Egypt. Fun-loving, with a heady mixture of somewhere exotic, somewhere you’d probably rather be. Visuals do so much for our games, but they’re often completed with the right balance of ambience. 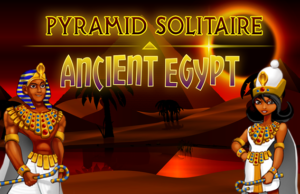 To create a soothing atmosphere, we delved into the world of audio to revamp Pyramid Solitaire: Ancient Egypt and give our players something to swoon over. Soon, we found the right sound for the overall game, but we’re sticklers for detail. What about the sound when you remove a card from the tableau? After all, that’s the aim of the game and it’s gotta make you feel good! So, the old sound was fine. It fitted the theme nicely and gave a twinkly wink of success initially. But after a few quick moves, the sound repeating multiple times in quick succession became kinda annoying. Actually, very annoying. So, we started out to find a replacement. Finding the right sound has its own challenges, especially when the change is tiny. You don’t have symphony-sized room to make someone feel happy, you’ve got half a second. We trawled through our in-house library for some inspiration but found nothing that was both less irritating and just as emboldening, if not more. We ventured out of our own realm and into outside sources, mostly consisting of royalty free, creative commons sites, such as freesound.org, soundbible.com, and audiojungle.net. Yet, try as we might, we came out from our search empty handed and so very sad and disappointed. Finally, we gathered our thoughts and decided to go for a one-time payment, licensed sound pack, chock full of different sound effects which would make an audio engineer weep with joy. It was audiojungle where we found this delightful pack, so the preliminary search was not a wasted journey after all. As a side note, we’d recommend any budding developer to make sure the licensing on audio suits your project, especially if players are going to be streaming the game. Make sure these sound effects can be used by any third party! The pack was like a gift from the Gods and once opened this veritable Pandora’s box, we were totally entranced by the sheer range. Whilst we had set out to find only one upgraded sound effect, we were tempted by the many versatile sound effects on offer that could be used multiple times. With some crafty slicing and pitch altering, we came out with tons of new sound effects, which we implemented with wild abandon. Now, a countdown could be used at the beginning of the round, to enhance that feeling of achievement when the round was complete, and score totals had some extra added sparkle. These new effects all culminated into a warm fuzzy feeling, kind of like a reward on the ears. Audacity handled the sound editing, a free wave editor, and then exported to Wwise. We use Wwise for all our projects, like many developers, including AAA developers. Now we have a game which not only makes you feel great, but sounds great too, down to the smallest detail. We know only 20% of casual mobile players play with sound, but it’s important to get it right for those tuning in. All data is held in accordance with GDPR. Please check out the app store to download all of our games for free. © Glowing Eye Games. All Rights Reserved.